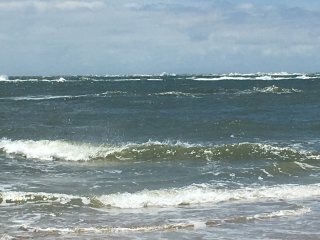 Our stay on Bald Head Island was extended to six days while tropical storm Colin quickly rolled up the east coast. I can’t think of a better place to be stuck. 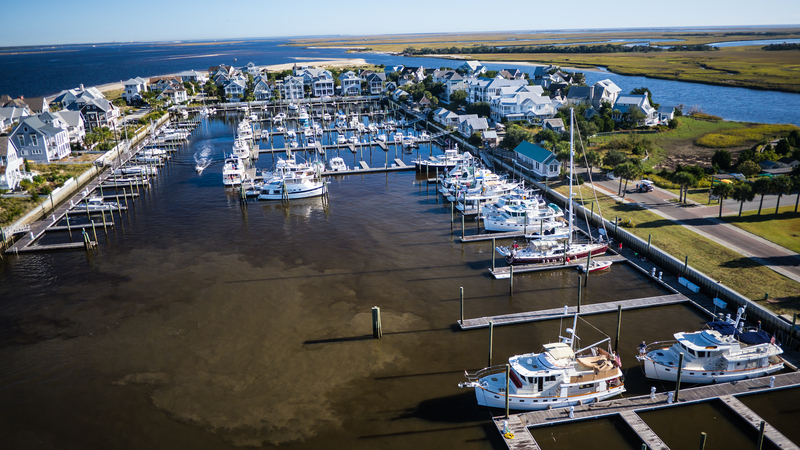 This small barrier island is one of our favorite stops. To read more about the island see some of our previous logs. While here we enjoyed many nice bike rides and also a nice paddle through the marsh. We were able to spend some time with Betty who is the owner of the Krogen LiLi and has recently purchased a home here. She has become a good friend and we enjoyed a lovely dinner at her beautiful beach home. The Nature Conservancy is very active on the island with educational tours and wildlife monitoring programs. We decided support this worthwhile organization by purchasing a yearly membership. 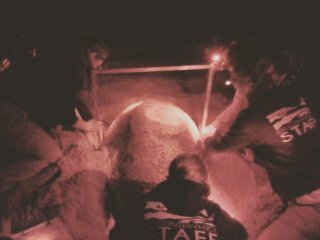 One of the benefits of our membership was the opportunity to join the interns during one of their nightly turtle nesting studies. Our night started at 9:30 PM walking the beaches in search of arriving loggerhead turtles coming ashore to lay eggs. 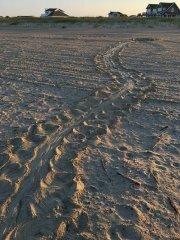 At the same time, several other interns patrol the 21 miles of beach in ATV’s. They will radio us when any turtle tracks are spotted. So far this year, 15 nest have been identified. There is no guarantee that we will see one during our brief venture but this is the beginning of the egg laying season. Last year there were over 110 nest between June and August. It looks like we are in luck. Before even leaving for the beach, a local resident calls in a turtle sighting. 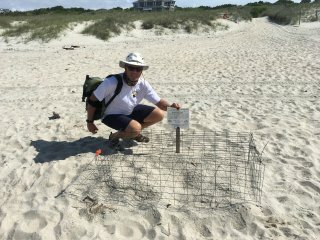 We hop in the golf carts and rush down to east beach where we find a 450 pound loggerhead turtle busy laying her eggs. The interns are surprised as this turtle has already laid her eggs and is in the process of covering the nest. 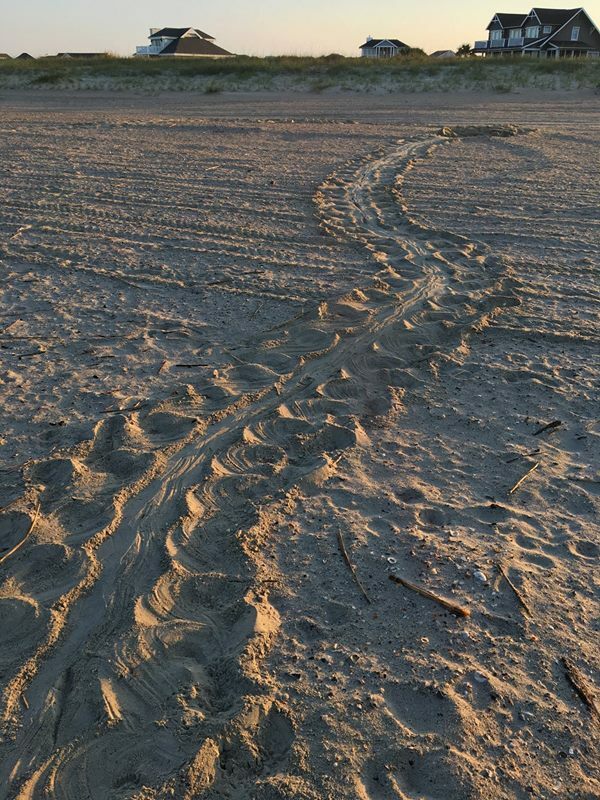 Usually, the turtles don’t start coming ashore until the early AM hours. She has finished her work and we follow her as she heads purposefully down the beach and back into the ocean. The interns will now cage the nest so that predactors will not disturbed it. Sometimes a nest is laid too close to the waterline for reasons unknown and must be moved further up the beach. The interns feel this nest location is fine for a successful hatching. While still preparing this site, a second call comes in. The interns in the ATV have spotted a second turtle coming ashore on the south beach. We leave two interns here to finish the cage while we zoom off in the golf carts along pitch black island roads leading us to this second nest site. This turtle is still digging her nest in preparation for laying about 100 eggs. Once she starts the egg laying process, we are able to approach her as she is now in a trance like state. The interns quickly check for flipper and pit tags. She has both and is also quickly identified by her shell markings as “Shark Bite”, a turtle that has been nesting here for many years. A DNA sample is taken from a flipper along with shell length and width measurements. It takes her about an hour to lay her clutch. We are able to observe this up close. The eggs look identical to a ping pong ball. Once the egg laying process is complete we must back away as she is no longer in her trance. We wait patiently while she covers the nest and begins her slow march back to the sea. This crawl is exhausting for this massive turtle. She will crawl three or four feet before stopping to rest. It takes her about 20 minutes to reach the waters edge. We follow her to the waterline until she disappears below the ocean surface. Work then begins for the interns to secure the nest site with a metal cage. This process is finished about 1 AM just as a third turtle sighting is radioed in. Our time is up so we say goodbye to the interns and head back to Idyll Time. Their work is just beginning. We later learn that a total of five nests were found this night. Six is the record for one evening. We feel blessed to have had the opportunity to witness two of these magical events. Our turtle experience is the highlight of this Bald Head Island visit. We hope to someday be here to observe a turtle hatching which is know as a “boil”. 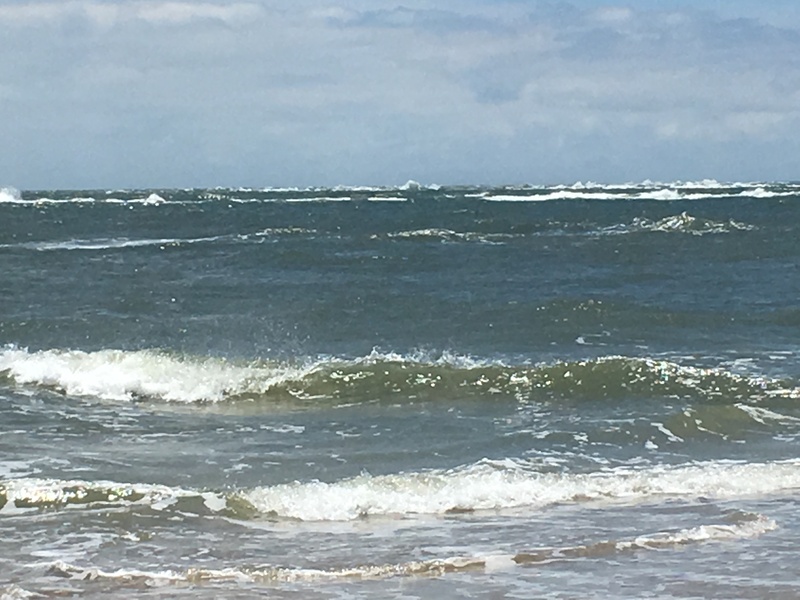 Our time spent on Bald Head Island was way to short and we are already looking forward to our return this fall. The next four days find us in delivery mode as we make our way to Atlantic Yacht Basin, where we will leave Idyll Time for a few months. 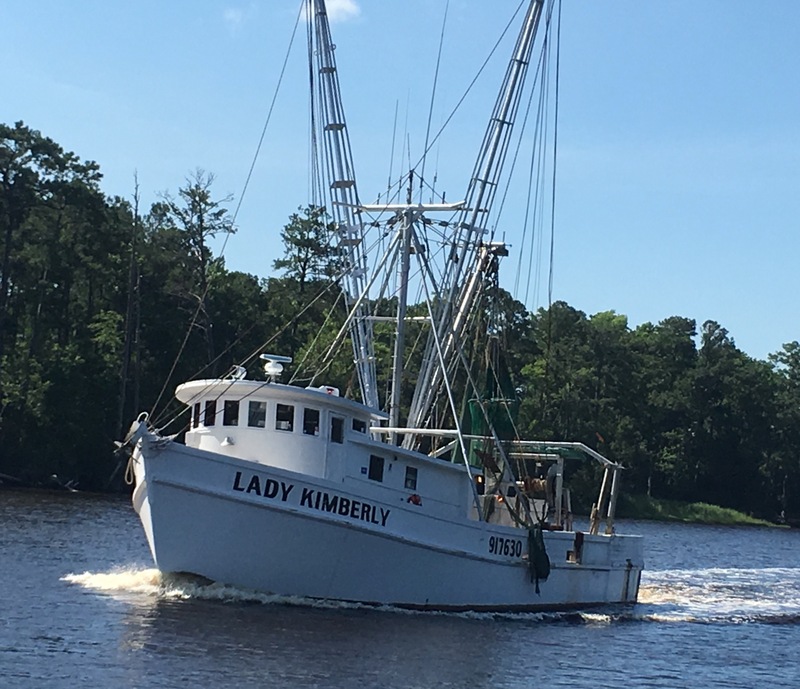 Our first day was a short one with a quick trip up the Cape Fear River and through Snow’s Cut to our anchorage at Wrightsville Beach. The next morning we were underway as the sun just started peeking over the horizon for our 80 mile offshore run. 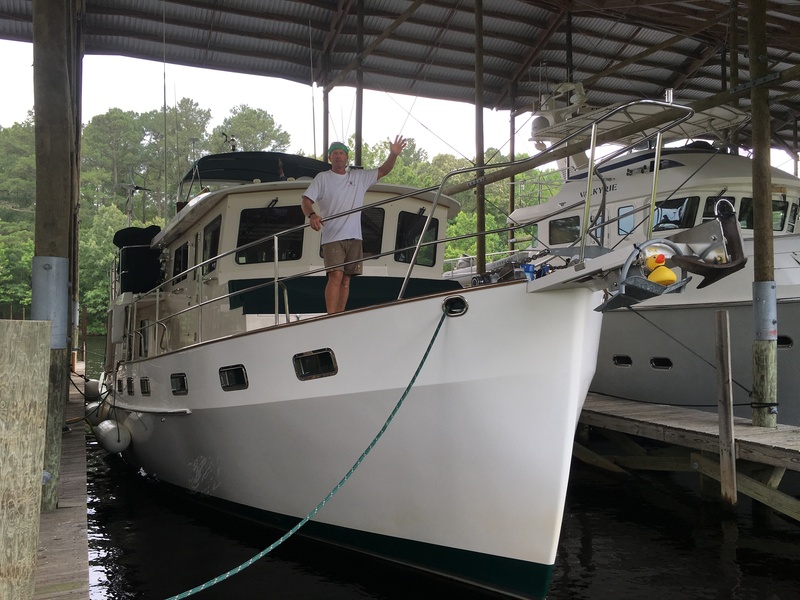 We rejoined the ICW at the Beaufort Inlet and continued our way up the river stopping for the second night on Broad Creek just off the Neuse River. It was a long 117 mile day. Our third day was another long 114 mile day. We stopped for the evening just after crossing Albemarle Sound. 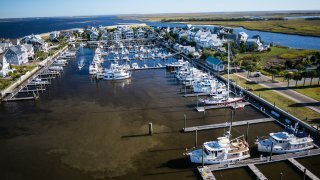 These waterways are relatively stress free with no major hazards to avoid. We have been pleasantly surprised to find the last few days cool and dry, perfect for anchoring out. In past years we have been forced to stay marinas so we could plug in for A/ C. It is so much nicer being able to anchor out not to mention being a lot less $$. Our final day of travel brings us past Coinjock, famous for it’s 32 ounce prime rib. And yes, Jeff has eaten the whole steak several times. Idyll Time is now resting up at Atlantic Yacht Basin while we return home for a few months of “dirt” time. We will be back aboard this fall for our return trip south. Thanks for following along with us on our journey. This entry was posted on July 1, 2016 at 12:59 pm. You can follow any responses to this entry through the RSS 2.0 feed. You can leave a response, or trackback from your own site. 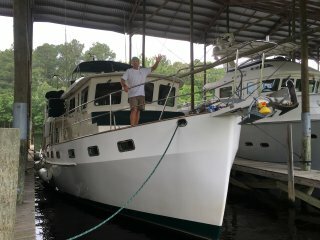 1 Response to "Bald Head Island to Great Bridge, VA"
As a teenager I played on Bald Head (Smith) hunted marsh hen in the fall and went to Bald Head on dates complete with bond fires , using whatever boat we could find. This is not my purpose in writing. We are about to buy our first trawler/aft cabin and I am being more picky about the engines, genset, tanks etc than I am her appearance. Looking for a 40-45 with some power. , Have you ever had to power out of inlet that wanted to eat you when you fell off a wave. By the way, you missed some pretty scenery by going outside. I understand why. There are a lot of “No Wake” zones there.